Two months or so back I purchased Nikons D7100 camera, targeted towards the 'enthusiast' photographer I was a little sceptical whether this camera would be up to the job of replacing my Nikon D300s. The camera uses a 23.5mmx15.6mm 24.1 megapixels APS-C sensor with the ability to add another 1.3x crop in camera reducing resolution to 15 megapixels. Well after two months of use its fair to say this little camera is punching well above its weight, since buying the camera I've managed to test it out a couple of times in Wales shooting fast jets in the NWMTA or more commonly known as the Mach Loop and also at some track days I have been covering for MSV and I've been pleasantly surprised. In fact my D300s hasn't been taken out of the bag since and is now my second camera body, the images from the D7100 are above and beyond those that are from the D300s - not only in terms of resolution and the ability to crop but also the fantastic tonal/dynamic range and sharpness of the images, no doubt down to the lack of an optical low pass filter. 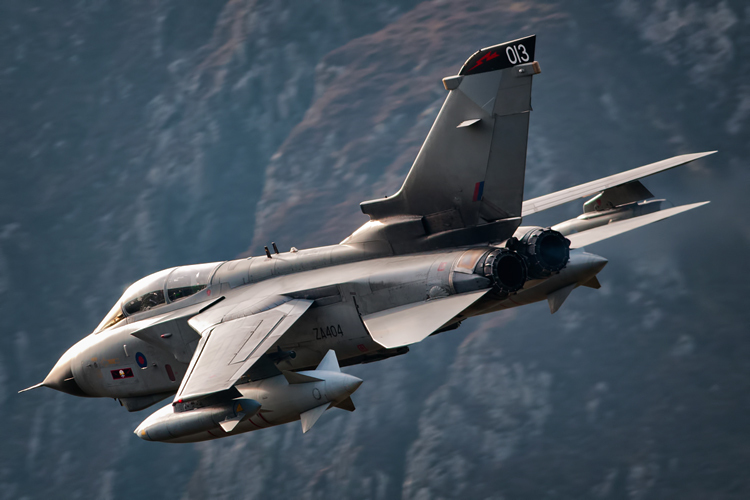 41(R) TES Squadron Tornado GR4 'Rebel 84' on a low level sortie in the NWMTA/Mach Loop. One thing the Nikon D7100 doesn't have going for it is a large buffer, with online tests varying between 5-8 shots depending on memory cards and RAW set-up. Initially this was a little worrying, after a little testing at the race tracks with only a 45mbs write and read Sandisk SD card my worries were cast aside. As long as you aren't a 'spray and pray' kind of photographer this shouldn't even be an issue, up until this date I've only hit the buffer once and that was down to myself machine gunning a Tornado GR4 through Cad. 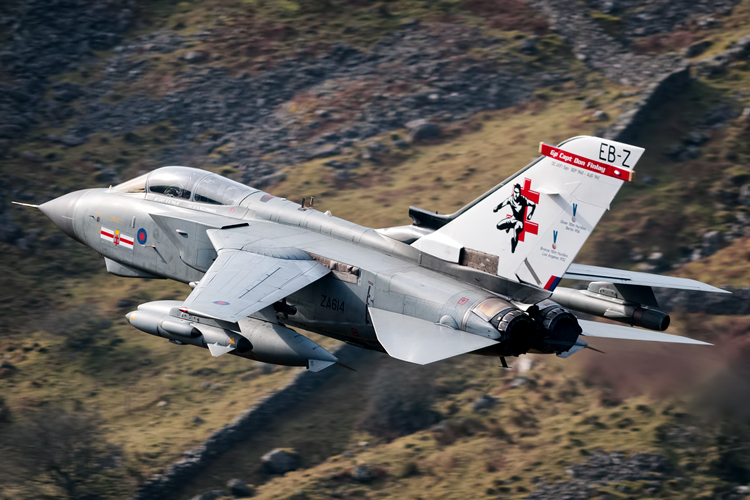 12(B) Squadron commemorative tail Tornado GR4 makes its way towards Cad in the Mach Loop, the jets last flight before RTP at RAF Leeming to sustain the current Tornado fleet. For me the ultimate test of a camera for my style of shooting and subject is the Mach Loop or LFA7, here you can witness RAF & USAF fast jets operating at 250 feet and between 420-450 knots - a test of both how well the autofocus works, buffer, FPS, exposure and any grain issues from high ISO (although I rarely shoot above ISO 400 if I can help it). The AF is lighting fast, I haven't yet tried the 3D tracking however as I've essentially set the camera up as my D300s is. As a friend once told me, the more you ask a camera to do the more it slows it down - ie keep it simple. I've found it trying to 'hunt' a couple of times but I've put this down to heat haze and also the bright light on the front of the Hawk T1 which used to confuse my D300s constantly. Initially looking at the images on the back of the camera I wasn't that impressed, they seemed to have a green tint to them but it seems this is more a back screen issue on the D7100 as the WB has been absolutely spot on for the most part apart from some tricky shooting conditions on my first trip to the Loop where the light was incredibly hazy. Up close in the cockpit with a pilot and WSO from 9 Squadron based at RAF Marham, you can see the WSO waving. Although not a direct replacement for the D300/D300s I couldn't be any happier with the D7100, it is leaps and bounds ahead of the D300 (rightly so) and is so much better than I expected. I really feel the camera has helped to 'up' my photography as I felt I'd reached my limit with the D300s. I'm really looking forward to giving the camera more of a challenge especially at the air shows this year. Well I've been a little side tracked with a few things over the last month so haven't had chance to update my blog so whilst I've got a little free time I thought it was best to write a quick update from the last month! A day spent in glorious sunshine situated on the Snakepit, not my favourite of locations for a number of reasons, mainly due to the big drop! It was a slow start to the day before the first movement, a Hercules C-130J kicking things off with a fantastic low pass, watching the crew snaking through the pass is always a superb sight. Crew line up the RAF Hercules C-130J for Cadair Idris pass, you can also see wing tip vortices trailing from the tips. 30 minutes after seeing the C-130J disappear around Corris Corner out popped a Tornado GR4, a 617 Squadron GR4 to be precise which had been involved in the small ex 'Fast Mover'. Two fantastic passes from the pilot before RTB to RAF Lossiemouth. "Apollo 1 & 2 looking to descend and complete 1 1/2 circuits of the loop, will be entering via the estuary" Something along those lines anyway, no more than 30 seconds later out popped two 41(R) TES Squadron Tornado GR4s, the trailing jet wearing the Olympic special tail commemorating Don Finlay. 41(R) TES Squadron Tornado GR4s dive into Cad. A closer look at the pilot and weapons system officer of the Olympic special tail jet. Perfect location to show the tail of in all its glory. A pair of Hercule C-130Js then appeared from Barmouth Estuary, sadly too spaced out for a nice 'two ship' photo but the light was great as the crew lined them up for Cad. The crew line up the C-130J for cad in the fantastic evening light. It was left to the same 617 Squadron Tornado as earlier in the morning to close the days action with a great pass, this time flown by a different crew and performing one pass. The 'Dam Busters' pilot dives into Cadair Idris pass. Once again the weather forecasters got it wrong, a day that should have been spent in full sun from 10am onwards was full of rain showers and cloud. Thankfully at 1100 the clouds parted and the RSAF Tornado IDS came storming around Hill 15 bathed in fantastic sunshine. The Tornado had been at BAE Warton for the past few years and was part of the Tornado sustainment programme for the Royal Saudi Air Force. Only a few days later the jet departed Warton aerodrome for a fuel stop at Malta before continuing onto Saudi Arabia. The pilot starts to swing the wings back to 63 degrees, the wings can't go back fully swept due to the big 'hindenburger' fuel tanks. With the wings swept back to 63 degrees the pilot passes Bluebell and prepares to flow right with the valley. After a few hours of waiting around and dodging the rain showers out pops the RSAF Eurofighter Typhoon T3, which was also based at BAE Warton before being delivered last week. Sadly the light was great for the pass. 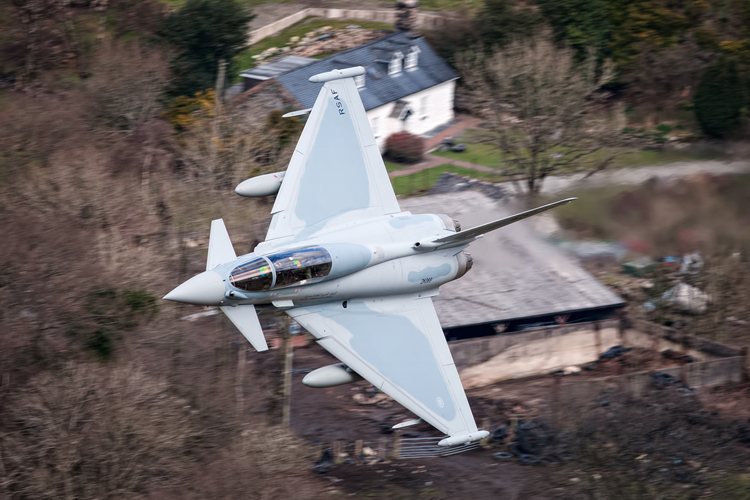 RSAF Eurofighter Typhoon T3 taking a low line around Bluebell. As usual thank you for looking.